Depression: Minnesota in the Thirties, by D. Jerome Tweton. Fargo: North Dakota Institute for Regional Studies, 1981. The Works Progress Administration papers collection includes information related to the history of Minnesota collected and prepared under the auspices of the Federal Writers' Project, administrative files, and a photo and negative collection containing numerous views of WPA projects around the state of Minnesota. Records of Governors Floyd B. Olson, Hjalmar Petersen, and Elmer A. Benson, 1932-1938. General correspondence, subject matter files, state department files, federal department files, and organization files documenting the gubernatorial service of Olson (1931-1936), Petersen (1936-1937), and Benson (1937-1939). Many of these files discuss economic conditions and programs for Minnesotans. 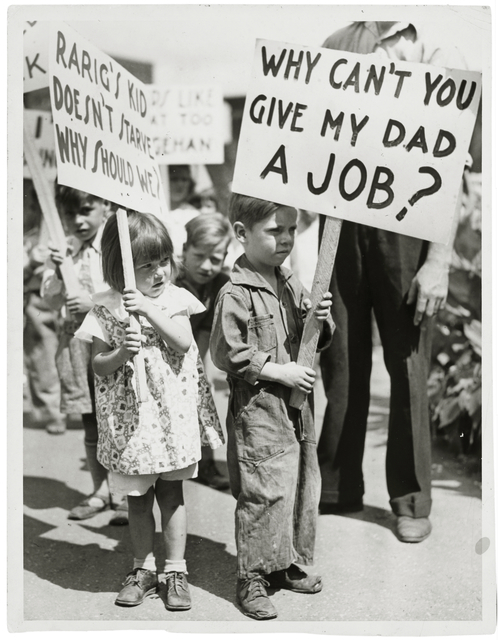 The great stock market crash on Oct 29, 1929, precipitated a series of drastic changes in the lives of many Minnesotans. Farmers throughout the state faced huge drops in crop and commodities values while city workers saw declining wages continue. These urban and rural residents found themselves joining forces to represent labor concerns throughout the state, leading to increased participation and election of Farmer-Labor association candidates. New Deal programs such as the Works Progress Administration and the Civilian Conservation Corps provided unique employment opportunities throughout the state. And while the political and economic landscape of the state evolved, life in Minnesota went on. Original materials, records, and newspapers on microfilm are available on site and reference staff can help with research. Order copies of records, articles, or other specific materials from the MNHS collections. MNHS loans out most microfilm materials. Contact your local library for more information and assistance with this service. Some items such as newspapers, articles, photos and objects are available online. Look for links within this guide. Many books listed in the Secondary Sources page can be borrowed from other libraries. A guide listing the resources available at the MNHS library.